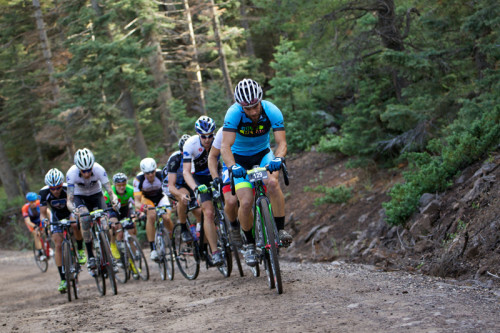 BEAVER, UT: On Saturday, July 11, 2015, 600 riders, including some of the nation's best road, mountain, and cyclocross racers will descend on the small southwestern Utah town of Beaver for the Fifth Annual Crusher in the Tushar, presented by DNA Cycling. The 69-mile course through the remote wilderness areas of Utah's little-known Tushar Mountains and Fishlake National Forest features a near-perfect 50/50 split of paved and dirt roads spanning two counties and approximately 10,000 vertical feet of climbing, before finishing at Eagle Point Ski Resort, with a summit just under 10,400 feet above sea level. Growing up in the small town of Beaver settled by Mormon pioneers in 1856, also known as the birthplace of both the notorious outlaw Butch Cassidy and inventor of the television Philo T. Farnsworth, Burke Swindlehurst long dreamed of putting on a race on his favorite training grounds, but it wasn’t until after his retirement from the pro ranks in 2010 that he was able to realize this dream. 2015 marks the fifth edition of the race which continues to grow in prestige year-after-year; its well-deserved reputation due to both the difficulty of the course and incredible support from the local townspeople on both sides of the Tushar range in both Beaver and nearby Piute Counties. As with the first running in 2011, the winner of this year's Pro/Open men's race will be anyone’s guess, as previous winners Tyler Wren (2011-12) and Levi Leipheimer (2013-14) will not be lining up this year. Wren, the former Jamis-Hagens Berman pro who finished on the podium in 2013 and 2014 in addition to his two wins, has retired from racing and is now promoting his own cycling events through the bucolic farm lands of upstate New York and Vermont. The favorite to top the podium in 2015 will likely be Wren's former Jamis-Hagens Berman teammate and current Raleigh-Clément cyclocross pro Jamey Driscoll, who has shown a steady progression in his three prior participations, finishing 7th in 2012, 4th in 2013, and as runner-up to Leipheimer in 2014. Also in contention will be fellow New Englanders and pro cyclocross riders Jonathan Page (Fuji/Spy Optics) and Tim Johnson (Cannondale), along with Sho-Air/Cannondale pro mountain biker Alex Grant (4th 2012, 6th 2013). Like Driscoll, Grant and Page now make their home in Utah. Brian Jensen (Tradewind Energy), who won the 2014 edition of the Dirty Kanza 200, and 6-time Leadville 100 winner Dave Wiens (Topeak-Ergon) are both anticipated to stake their claims to the Crusher title as well. Also anticipated for 2015, cancer survivor Connor O'Leary (winner, along with his dad and fellow cancer survivor Dave O'Leary, of The Amazing Race 24) and Tyson Apostol (winner of Survivor: Blood vs. Water) will vie for the coveted “best professional cyclist turned reality TV star” title. As one of the few events offering equal purses for both Pro men and Pro women, the competition in the women's field, while smaller, is expected to be just as fierce, with defending Crusher champion and 2014 USAC Endurance silver-medalist Joey Lythgoe (Kühl) facing strong challenges from pro cyclocross rider Nicole Duke (Marin/Spy Optics), pro Enduro rider Kelli Emmett (Juliana/SRAM). Perennial Utah state championship contender Mindy “McCrushin” McCutcheon (Canyon Bicycles/Shimano) finished 4th in her first Crusher attempt in 2014, and is looking to move a step or three higher on the podium this year. Also anticipated to make appearances are former U.S. National Road Race Champion Robin Farina, and two-time Canadian National Champion (Road & Time Trial) Lyne Bessette. As always intended, the Crusher tends to bring out a wide variety of riders and their steeds, and the perpetual battle to determine the right bike, the right wheel/tire combination, and the right gearing will likely never be completely resolved. The only guarantee is that at some point during the race, each rider will feel that his or her choice will have been very, very wrong.